The charter bus Tampa Bay service we provide is perfect when you are looking to travel in and from this region or around the city. You might be here on a holiday and traveling in a group. It would be more fun and cost effective to book one of our charter bus rental vehicles and go around town. Call us now 813-514-6980! There are diverse requirements that our mini or shuttle buses help to fulfill. For instance the 20 passenger mini bus models we provide will allow one to choose transportation for small groups of people like a shuttle ride for an office or for school children. For transporting larger groups it would be suitable to look at the several 30 passenger shuttle bus models we have. There are about 40 passenger charter bus models and more out of which one can book a suitable vehicle easily on our site. All one needs to do is log onto our portal and find the vehicle that they want to hire. Once the right vehicle is found, you can check the details online and rates of hire as applicable. You could even get in touch with the charter bus customer care department if you wish to avail of daily or hourly rates. The charter bus rental service is flexible as per the requirements of the customers. Our live support team is standing by to assist you 813-514-6980! For groups attending weddings, birthday, or any special occasion for that matter, you might also be interested in our Tampa Bay party bus rental service! iTrekkers; it is a fishing venture for sports lovers. The Florida Aquarium; check out a wide range of aquatic creatures found in this world famous aquarium. Busch Gardens; one of the scenic spots around the Tampa Bay, you will surely love visiting this area with your friends or family members. Art and Cultural Center Tampa Bay; a place to catch entertaining and live shows in this region. Science and Industry Museum; an educational place that is a great place to take children to. The airport shuttle services that are provided through the bus charter agency are beneficial and cost effective for many. One can find out details about the airport shuttle rides, the timings and rates on the website and proceed to book a shuttle service accordingly. Limousines for rent in Tampa Bay are also an option for airport transport. 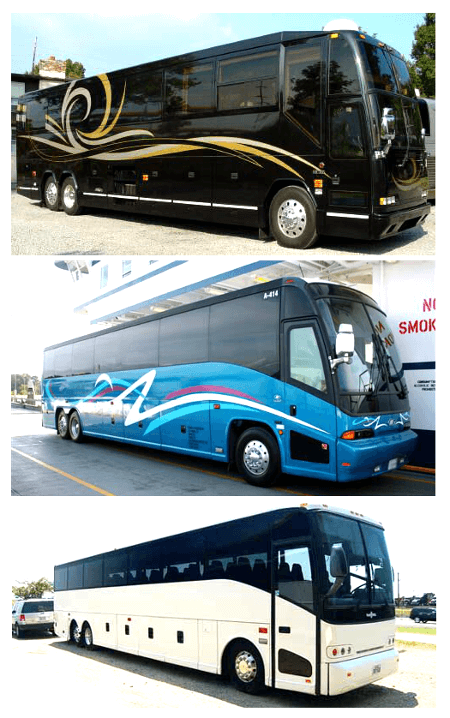 There are several 50 passenger charter bus models offered by our charter bus Tampa Bay for long distance travel. For those who wish to travel in comfort and in groups, opting for one of the car shuttle rental vehicles will be beneficial. There are several cities and places in and around Tampa Bay like Tampa, Safety Harbor, Mango, Citrus Park, Brandon, Largo, Temple Terrace, Seminole, Gulfport, and Bloomingdale which people travel regularly from here.